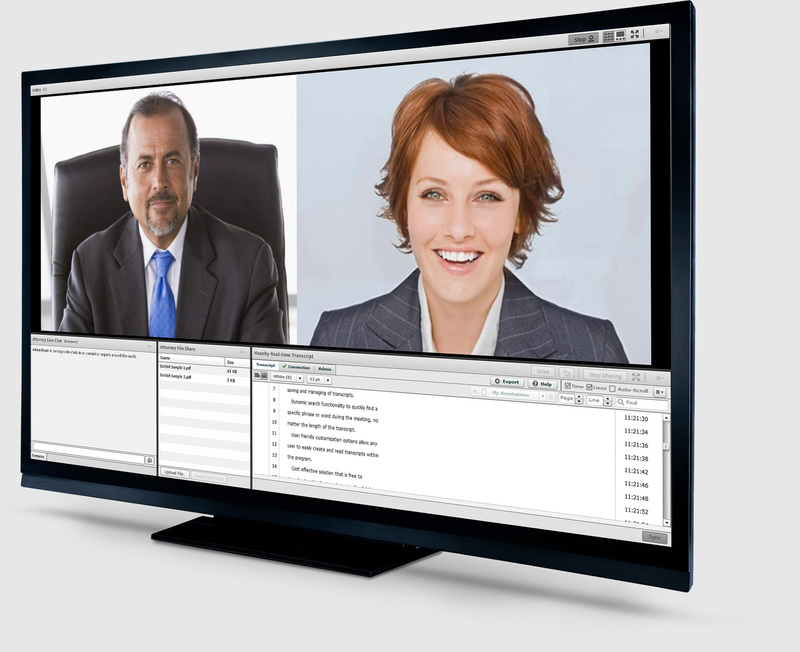 HusebyConnect provides the ideal virtual deposition environment by bringing together the most effective, low-cost way to communicate with counsel and depose a witness anywhere in the world from the comfort of your office. Use a webcam or connect directly to a videographer's video feed to view live testimony. 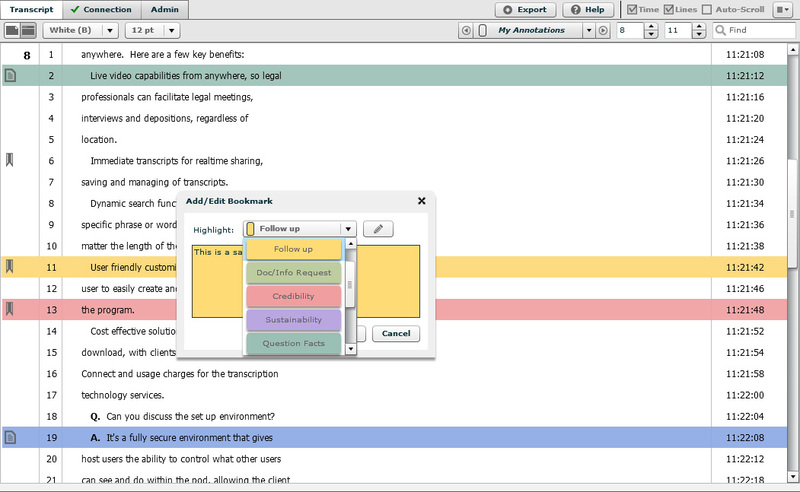 View and interact with a real-time transcript feed, including highlighting, notes and issue coding. Improve productivity by prepping a witness remotely. HusebyConnect provides rich multimedia and video experiences by integrating video and audio conferencing in a robust platform to view on virtually any device. HusebyConnect allows you to access and share robust media without requiring any downloads, enabling participants to enjoy a truly face-to-face experience. For live video during a deposition, arbitration or trial, Huseby will connect the witness through a webcam or directly through a professional videographer’s camera. Participants can connect through a built-in or external webcam by simply clicking Start My Webcam. Video can be displayed in two formats: Grid mode is a side-by-side view showing all participants in the same size video picture. Film strip mode shows the witness in a larger video picture and participants in smaller video pictures below. Show video from any device. Use a built-in webcam or an external HD webcam. View the same live witness video streamed directly from a professional videographer’s camera that you will receive on your DVD synch. Record the video for playback during deposition or trial prep. 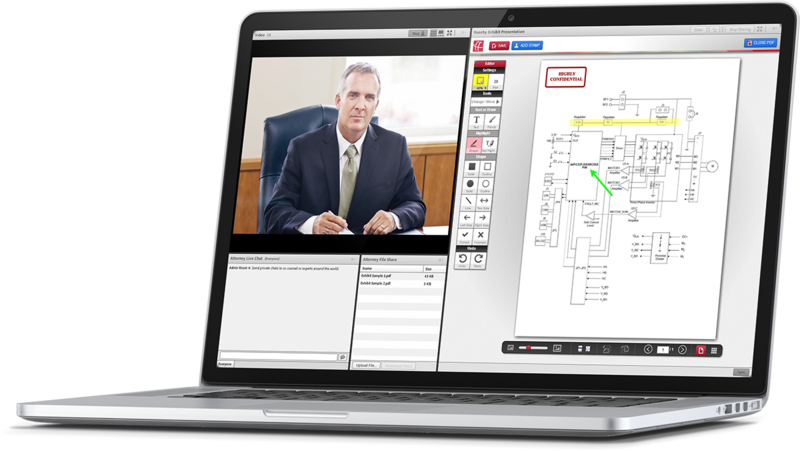 Leverage existing investments by integrating HusebyConnect with video teleconferencing systems supporting SIP/H.264. HusebyConnect allows you to conduct your next deposition electronically instead of hauling boxes of paper documents, including all previously marked exhibits in your case. Exhibits can be presented, annotated, stamped confidential and marked with a custom exhibit sticker – all digitally. Once saved, exhibits will be sent directly to the reporter and saved in your repository for immediate access. New documents to be marked as exhibits can be pre-uploaded from your local computer, DropBox or repository, as either private or shared. A blank “sheet” can be presented similar to handing a blank piece of paper to a witness. Exhibits can be uploaded from your local computer any time before or during an event. All previously marked exhibits are available in the history section of the presentation tool to open in the event for reference any time. Present an exhibit simply by clicking open. Annotation tools are similar to Adobe Acrobat. Annotation rights can be passed to the witness. The only tool that truly maintains the same process as paper exhibits in a virtual space. Minimize or eliminate paper at depositions, with digital access to both newly presented and previously marked exhibits. Can be used locally or across the world. Practice mode allows you to become a pro before using the tool at your next deposition. Security is essential. All data is managed, stored and replicated in real-time at one of the most secure, HIPPA-compliant, data centers in the world. All data is 256-bit encrypted in transit. Easy to use. Schedule a demo today to see just how easy and intuitive the tool is to use. Bookmark lines for quick reference. Make highlights, issue codes and notes directly on the transcript. Dynamic keyword search which auto-populates as you type a word. Easily toggle or jump between annotations to reference previous testimony in seconds. Email the draft transcript, either with or without your annotations. Export the draft transcript with annotations to Summation, LiveNote or CaseMap. Send private or group chat messages to participants. HusebyConnect provides everything counsel would have locally at a deposition in a virtual space, including the latest in real-time transcript technology. HusebyConnect real-time transcripts include dynamic keyword search functionality, highlighting, issue coding, bookmarking and notes, from anywhere in the world. Immediately after the deposition a draft transcript is saved in your portal, including all of your notes and annotations. Counsel then has the ability to continue to annotate the draft transcript or export the transcript and annotations to Summation, LiveNote or CaseMap. All you need is a computer or tablet and an internet connection. Counsel can receive the real-time feed onsite or from across the world. Bookmarks, highlights, issue codes and notes are automatically saved in your portal for immediate review. Before your next deposition or trial, improve productivity by prepping your witness virtually and record the session for immediate playback. All you need is a computer, internet connection and webcam. Documents or test exhibits can be presented, annotated and saved. Record the session and play back the interactive recording of the video and document presentation. Save time and money by conducting witness prep virtually. Mirror the actual deposition or trial experience. Recordings can be accessed anywhere, anytime through a secure private portal. Documents can be presented, annotated and marked to simulate the actual deposition or trial experience. 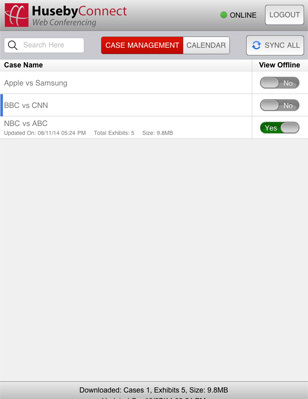 HusebyConnect’s mobile app makes connecting to a deposition or accessing your work product even easier by using an iPad or Android tablet. 01Download the mobile app for free from either the Apple Store or Google Play. 02Use the same username and password as you do to connect to the cloud application on your desktop. 03Work with all case content while connected to the internet. 04Select specific cases to download to your tablet to be able to work with the case content while you are not connected to the internet, for instance if you are traveling on a plane. 05Hit the synch button when reconnected to the internet to synch any changes made to content when offline or when new content is available for downloaded cases. 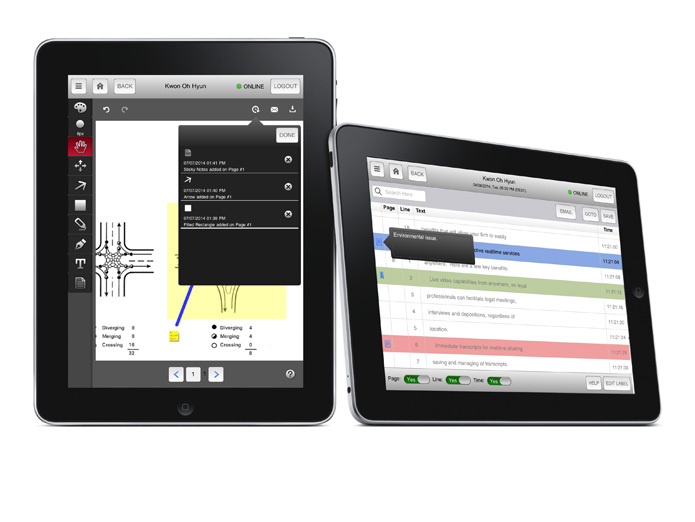 06Interact with your draft real-time transcripts anywhere, anytime by making highlights, notes, and issue codes. 07Interact with your final exhibits by making annotations and notes. 08Easy to use. Schedule a demo today to see just how easy and intuitive the tool is to use. Schedule a demo today to see just how easy and intuitive the tool is to use. Ability to work with your cases content anywhere, anytime. The only tool that allows you to work with case content both online and offline. 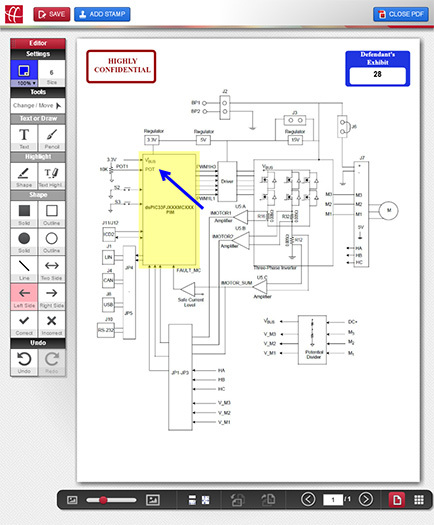 Exhibit annotation tools such as lines, arrows, free draw, shapes and highlights are easy to use. A history button allows you to view a list of all document annotations and the ability to jump to each annotation. Email a copy of each final PDF exhibit either with or without your annotations. Transcript annotation tools such as highlights, issue codes and notes are easy to use. Email a copy of each draft transcript with or without your annotations in PDF format. View a report of all transcript highlights, issue codes and notes in Adobe Acrobat. Counsel has access to a secure, private portal equipped with a calendar of upcoming events, details about each event and a link to join the day of the event. After each event counsel has instant access to content created, including marked exhibits, draft transcripts and event recordings. Counsel can create a HusebyConnect account by setting a private password. Counsel is greeted with a user-friendly calendar to view and join upcoming events. Enjoy unlimited access 24/7 to the content created during the event from any device. Download cases to an iPad or Android tablet for review off-line. Access 24/7 from any device. Join an event directly from your personal calendar. Add event details directly into Outlook. Secure repository to access final work product anywhere, anytime. Immediate access. Access final exhibits as they are marked into record. Immediately following the event counsel has instant access to the draft transcript with all highlights, bookmarks and notes. Recordings are interactive and include video, real-time transcript feed and exhibits being presented.